A hacker known as “TMC” is distributing the CryMore ransomware across computers worldwide. This file virus encrypts or deletes files based on a predefined list of file type extensions. Victims of the malware can follow our complete CryMore removal guide to restore their computers and recover the affected data. Skip all steps and download anti-malware tool that will safely scan and clean your PC. How Does CryMore Ransomware Infiltrate the System? The Crymore ransomware can be delivered using all strategies used by Hidden Tear variants. The analysis shows that the current versions of the virus have been made by a single individual. This narrows done the possible strategies to a few choices. One of the primary methods is the use of spam messages that rely on social engineering tricks. The hacker creates templates that imitates famous companies or even government institutions. The CryMore payload is bundled as a file attachment or a hyperlink in the body contents. As it is distributed as a single file it can also utilize scripts in software installers or office documents. The computer targets in practice infect themselves by opening such data. This is the reason why all files and applications must be downloaded from official sources only. Malicious instances of the CryMore ransomware can be hosted on hacker-controlled download sites and portals, as well as P2P networks where pirate content is usually found. BitTorrent trackers are a very popular source of all kinds of infections, particularly Hidden Tear samples. Another method of virus deployment is the bundling of the CryMore ransomware in customized browser hijackers. They represent malicious web browser addons that pose as useful additions. The hackers typically create versions for the most popular applications (Mozilla Firefox, Google Chrome, Safari, Microsoft Edge and Internet Explorer) and distribute them on fake store-type sites. Upon installation they modify important values that redirect to download portals where the CryMore ransomware can be found. This includes the default home page, search engine and new tabs page. The browser hijackers also retrieve private data such as any stored cookies, history, passwords, account credentials, bookmarks and settings. Security researchers have detected a new computer virus known as the CryMore ransomware. It has been created by a hacker under the alias “TMC” and at this moment detailed information about their identity is not available. According to the initial security analysis the creator of the CryMore ransomware has used snippets of previous viruses in its core. One of them is the Hidden Tear open-source project which has been used to create thousands of variants. The captured CryMore ransomware samples are still in a testing phase, according to the specialists not all modules that are referenced in its structure are complete and functional. At this moment the computer virus only contains an encryption engine that targets sensitive system and user data based on a predefined list of target file type extensions. Depending on the targets it can be customized by the hackers to include a large variety of targets. In the most common cases the CryMore ransomware should affect data such as: documents, music, videos, archives, backups, databases, configuration files and etc. 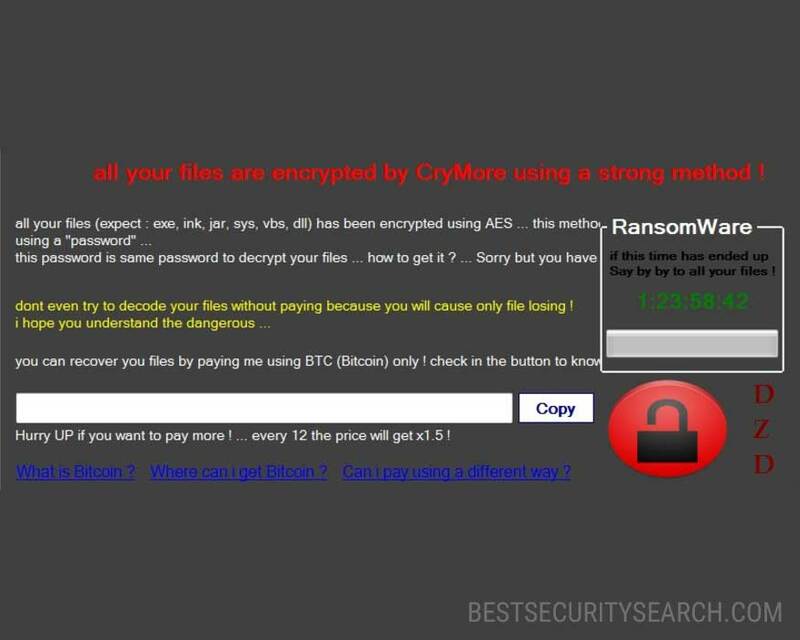 all your files are encrypted by CryMore using a strong method ! dont even try to decode your files without paying because you will cause only file losing ! The hackers use a template message that has not been customized according to the specific ransomware. Like other related viruses it enforces a time limit and aprice doubling if the sum is not paid within a short time. The grammar and spelling mistakes are typical for such low-quality viruses. We suspect that future versions of the CryMore ransomware are going to add new components to the virus. Examples include a Trojan agent that is going to allow the hacker to remote control the infected machines and spy on the users activities. Evolved Hidden Tear strains can also be used to gather sensitive information from the victims and lead to identity theft. The application buttons that supply information to the victims about the Bitcoin digital currency are laid out in three questions – the nature of the currency, how the victims can acquire the needed amount and if there is an alternative. In most cases the hackers specify fixed sum which can grown several times depending on the time frame of the payment. We would like to remind all CryMore ransomware victims that all transactions made using Bitcoins are anonymous and cannot be traced to a single individual or collective. Our complete CryMore removal guide shows how victims can recover their computers from the dangerous virus. After it has been deleted from the PC professional-grade data recovery software can be used to bring back any processed files. WARNING! Manual removal of CryMore Ransomware requires being familiar with system files and registries. Removing important data accidentally can lead to permanent system damage. If you don’t feel comfortable with manual instructions, download a powerful anti-malware tool that will scan your system for malware and clean it safely for you. This will isolate all files and objects created by the ransomware so they will be removed efficiently. The steps bellow are applicable to all Windows versions. Some ransomware threats are designed to hide their malicious files in the Windows so all files stored on the system should be visible. WARNING! All files and objects associated with CryMore Ransomware should be removed from the infected PC before any data recovery attempts. Otherwise the virus may encrypt restored files. Furthermore, a backup of all encrypted files stored on external media is highly recommendable. Stellar Phoenix Data Recovery – a specialist tool that can restore partitions, data, documents, photos, and 300 more file types lost during various types of incidents and corruption. Enable and properly configure your Firewall. Install and maintain reliable anti-malware software. Check regularly for available software updates and apply them. Disable macros in Office documents. Don’t open attachments or click on links unless you’re certain they’re safe.